This story pack contains 5 short illustrated books with simple sentences for readers. A the end of each, read, trace, and practice the basic vocabulary! This themed story pack includes 11 short stories about colors and art, written for beginning readers, from grades K-2. Each of them focuses on a color and its characteristics, and is a quick read with 5 comprehension questions. An answer key is included. • New topic-specific vocabulary in art. • A variety of question types, including Yes/No, Multiple Choice, and Fill in the Blanks. 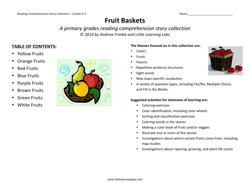 This themed story pack includes 8 short stories about fruits, written for beginning readers in primary grades, especially K and 1st, but possibly 2nd, too. Each of them focuses on a color, and is a quick read with 5 comprehension questions. An answer key is included. 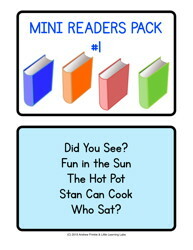 Primary Reading Comprehension Pack - How's the Weather? This themed story pack includes 12 short stories about weather and temperatures, written for beginning readers, from grades K-2. 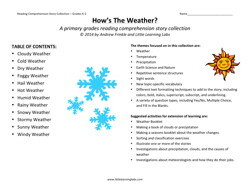 Each of them focuses on a type of weather and its characteristics, and is a quick read with 5 comprehension questions. An answer key is included. •	Different text formatting techniques to add to the story, including colors, bold, italics, superscript, subscript, and underlining.